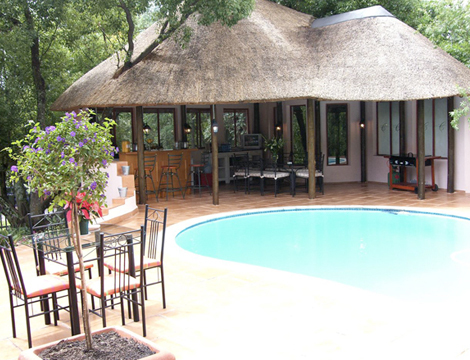 Accommodation in Johannesburg: Chislehurst Guest House. 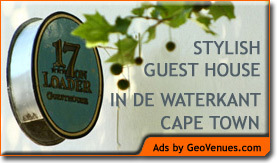 You are here: Home / Gauteng / Johannesburg / Accommodation in Johannesburg: Chislehurst Guest House. Chislehurst is an elegant private guest house in a leafy suburb of Rivonia, Sandton. Just 20 minutes from OR Tambo International Airport, Chislehurst is close to the vibrant hub of Rivonia with it's business centres, shops, restaurants and places of interest. Nearby are cinemas, shopping malls, craft markets, and the amazing Montecasino Mall. Chislehurst is set in a quiet, secure environment, with 24 hour security. A peaceful place for walkers and joggers in the morning and evening, close to a lovely part of the Braamfontein Spruit (stream), where the Rivonia River Rangers patrol on horseback each Sunday morning. The proximity of the Spruit ensures an abundance of birdlife, and guests can enjoy spotting some unusual species while relaxing on their private patio, or in the lovely thatched lapa by the pool. Rooms are serviced daily by our friendly staff, and rates include a delectable breakfast, with a complimentary bottle of bubbly on a Sunday morning. For more information, visit Chislehurst's website here.